Boil eggs, remove the shell. Make small scars on the eggs with a knife. Heat a table spoon of oil in a pan. Fry the boiled eggs to golden color and keep aside. 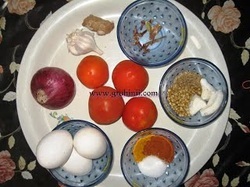 Make fine pastes of Onion, tomatoes and coconut with whole dhaniya and jeera separately. You can see in the pic. Heat 2 table spoons of oil in the same pan. Add cloves and cinnamon. When cloves starts spluttering add ginger garlic paste, fry for few seconds and add onion paste. Fry until the paste turns pink. Now add mirchi powder, haldi and dhaniya powder. Stir well and add the tomato paste. Cook until the tomato paste starts leaving oil. 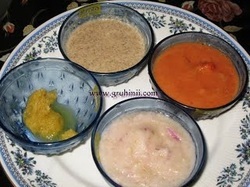 Add the coconut\ dhaniya\jeera paste mix well and add salt to it. Now add the fried Eggs to it. Stir carefully and close the lid and cook in a low flame for 10 to 12 mins. until the gravy thickens and the curry is done. Take the curry into a serving bowl and garnish with fresh dhaniya leaves. 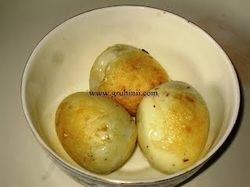 Tasty Eggs Masala Curry is ready.....................Tastes good with Rotis, chapatis or Rice.